As if getting your hands on Girl Scout Cookies wasn't dangerously easy enough, several reports over the last few days indicate the iconic treats are now available to buy with two-day shipping via Amazon Prime. While this may seem like a major victory for lazy Thin Mints hoarders everywhere, Girl Scouts of the USA is now strongly urging fans to avoid purchasing the cookies from the retail giant -- for a few important reasons. Search "Girl Scout Cookies" on Amazon, and you'll find several buying options for popular flavors like Thin Mints, Samoas, and Tagalongs available with Amazon Prime's convenient two-day shipping, most of which are marked up a few bucks to around $10 per box. But it turns out the cookies are not being sold by GSUSA or actual Girl Scouts, but rather third-party resellers likely looking to profit from your urgent need for more cookies. For that reason, the organization warns there's a chance the cookies might not be authentic or possibly even stale. "We cannot say with certainty that anything related to Girl Scouts that is purchased through a third party retailer are officially licensed Girl Scouts products," a GSUSA spokesperson said via email. "Furthermore, even if they are genuine Girl Scout Cookies, neither Girl Scouts of the USA nor our licensed bakers can guarantee the safety or quality of the product, or that the cookies have not been tampered with. Many cookies sold via third parties are often expired." Numerous negative reviews on Amazon product pages suggest that dozens of people who purchased the cookies received ones that were stale, broken, and in some cases, melted; however, there are also plenty of positive reviews. 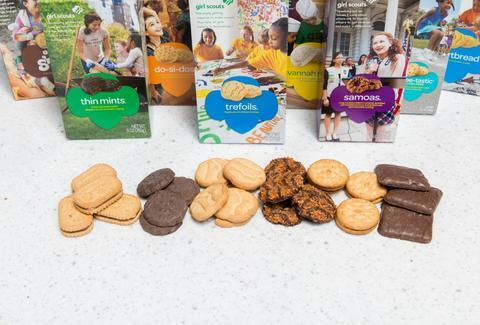 But in addition to potentially trading quality for the convenience of two-day shipping, GSUSA argues buying the cookies through a third party defeats the purpose of the cookies altogether because you're not interacting with a Girl Scout. "The Girl Scout Cookie Program is one of the most powerful and effective financial literacy programs in the world, and it has been teaching girls basic business acumen since the first known sale of cookies by Girl Scouts 100 years ago," the organization said. "The five essential skills of goal setting, decision making, money management, people skills, and business ethics are the engine that drive the cookie sale forward. Third party retailers remove girls from the equation entirely, denying them the opportunity both to gain crucial financial literacy and business skills, as well as to earn proceeds for their troop and local council, which go directly toward community projects and powering amazing experiences for girls." When asked if the GSUSA thinks people should buy Girl Scout Cookies from Amazon, a spokesperson said, "Definitely not." Instead, GSUSA recommends checking its website to locate where Girl Scouts are selling the cookies at booths in your area. If you know a Girl Scout, you can also order the cookies online via her Digital Cookie website, which is available to friends and family. But, really, if you haven't already procured your annual stash of Thin Mints, Samoas, and your other favorite flavors three whole months into Girl Scout Cookie Season, then you're doing it wrong. Tony Merevick is Cities News Editor at Thrillist and has yet to get his hands on some Thin Mints this year. Send news tips to news@thrillist.com and follow him on Twitter @tonymerevick.